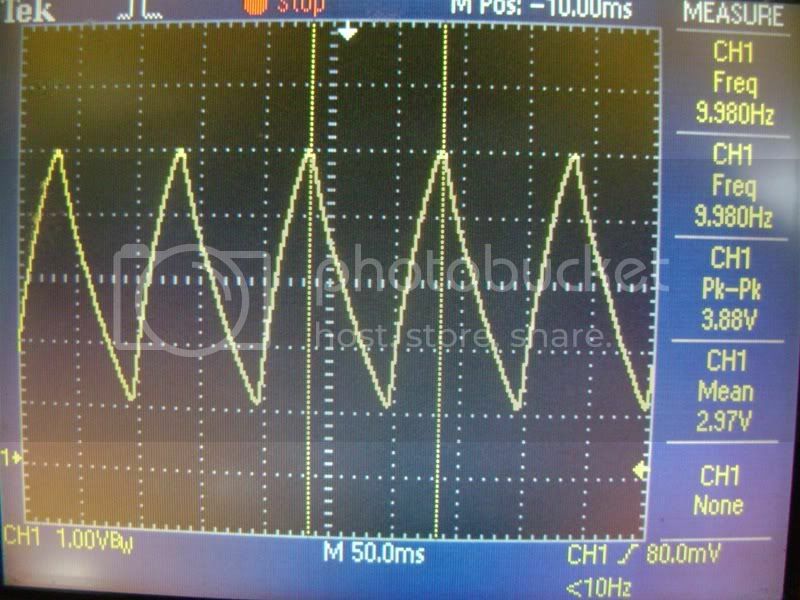 I just measured some waveforms of the LFO (opamp based) using my digital scope. the max speed is 0.5Hz and min is 10Hz. the lamp driving signal is a triangular shape but as per RG's tech of univibe, the LFO of the original univibe is producing a sinewave, could this be one reason why this isnt as swooshy? qwixzh wrote: I just measured some waveforms of the LFO (opamp based) using my digital scope. the max speed is 0.5Hz and min is 10Hz. the lamp driving signal is a triangular shape but as per RG's tech of univibe, the LFO of the original univibe is producing a sinewave, could this be one reason why this isnt as swooshy? I've just received a Chicken salad that I want rehouse in a Hammond box . What are the values of pot ? I can't read that inside. I think the dual pot (speed) is a 100KC and the trim is 101 ( I think that corresponds to 1K ?) but I don't know the "intensity" value. Yeah I found that since I posted my message. the bigger issue is to find 100ohm pot to have an external pot. But I think I found one at Banzai. devastator wrote: Yeah I found that since I posted my message. yeah but the curve will be a little bit different, not really the same. it exists a 4mm axis version (lower price) but I don't know if that will be good with the knob's hole. I've got an electrical engineer friend who is gonna help me rehouse the rocky road. If I knew the pot values and which switch to buy for true-bypass, I could go ahead and order my parts. This would really help me out as I would only have to make the drive to his house one time. Can anyone at all tell me what the pots and switches should be? Thanks so much! here's a shot of the LAMP drive waveform. sawtooth almost triangular waveform, seems really sharp? I can mod this into a sinewave but will moding this do any good? Anyone re-housed a plastic Behringer pedal? I really like the sound of my vintage delay pedal but with the plastic housing I know it will not last forever. I am kinda picky about my delay and I really do like this one. Anyone dissected one of the cheap plastic Behringer pedals? Re: Anyone re-housed a plastic Behringer pedal? Well I have it all open and I am feel pretty confident so far. I was going to use a electrical box as I have seen done here before but it does not quite fit. I think I am going to buy a scratch N dent box from Pedal Parts Plus and I need pots. I already have Switchcraft plugs and an extra 3pdt if I can use that. What ohm pots should I get? The originals do not indicate to me. qwixzh wrote: here's a shot of the LAMP drive waveform. sawtooth almost triangular waveform, seems really sharp? I can mod this into a sinewave but will moding this do any good? I wonder how much difference you'll get as the lamp will smoothen to a more sinewave like approach already. the trim pot actually adjusts the phase relationship of the signal. The only way I can describe it is to say that if you adjust the trim pot all the way it will basically turn the phasing off (dry)... all the way in the other direction will have only phased signal. BUT.. by carefully adusting it in the middle you are changing the blend of dry to phased signal. At a very minute point this will create a "notch" in the phased relationship. Where you place that notch will cause the signal to slightly modulate, causing the pitch to go slightly up or down (true Doppler shift). This will give you a sweeter sound. I adjusted mine to drop the pitch down slightly. My unit now has that classic Univibe "throb". So for a more believable , sweeter sound adjust your unit for that pitch change. It is VERY subtle. Less then a 10th of a turn will be too much. listen to it while you adjust it. I adjusted mine by plucking single notes heavily muted and listened to the background hiss to hear the pitch shift and it now sounds EVERY bit as good as my Fulltone. In fact I think its better ! Not as good as my new "Effector:Tube-Vibe" though !!!! It also has a similar internal adjustment. His literature also says that it adjusts the notch depth and by doing so you blend between chorus and vibrato sounds. I also tweaked my MXR phase 45 which is a single stage phaser. It also has a trim pot. Now it sounds JUST like my Chicken Salad ! Man... talk about tweakin. I'm a bit confused about wiring a volume pot to this thing! This is my first post. I'm looking forward to spending some time here reading, learning, and, hopefully, contributing. I had a credit with a shop and went ahead and picked up a cheap Behringer TO800 OD pedal. I plugged it in, adjusted the knobs and wow! What a surprise. That cheap pedal can produce tones very close to older Peavey amps. I couldn't believe it. So, I decided the worst part of the pedal was the case and went to replacing it. This is what I came up with. I drilled some holes, applied some paint, added a sturdy switch and mounted the Behringer "guts" in it. The Behringer had some surprises as it isn't made like most other effects pedals. Lot's of wierd switching things going on. The biggest being a momentary switch to activate it rather than a typical on/off switch. It was extra fun since I couldn't find schematics for the thing (NOT). I made a pattern in stiff paper for the knobs and LED using the original pedal as a template to mark where to drill the holes. I then centered it over the new enclosure, marked the holes with a sharpie and drilled them to size. This is the inside of the pedal showing the "insulation" I added to prevent the circuit board from coming in contact with the metal case or the metal parts on the jacks and switch. I just used a plastic "for sale" sign and cut pieces from it to fit. The parts on the far right (scroll over to see them) are the components I removed from the original pedal: the battery connector, the 1/4" jacks and the switch. This pic shows the jumpers I added to close the circuit. The original jacks have a "switch" in them that is closed when you plug in the 1/4" plugs from your guitar and your amp (or the rest of your pedal board). This keeps the pedal from draining the battery when not in use. Since I am not going to be using a battery with the pedal, I don't need that feature. This pic shows the added switch and the new 1/4" jacks. This pic shows the added DC power jack. The TO800 cost me $27.00. It's got some great tone but a lousy case. With a little work, it's not bad for the money. The case cost $7.00. The switch was $5.00 and the two 1/4" jacks were $2.00 each. I posted this in another thread, but it may have been better to put it here.